On a helm with a wreath Or and Sable issuing from a Coronet Or a demi-lion Ermine holding between the paws a mitre Or. A demi-lion erased Ermine holding in the dexter paw an Ostrich feather Argent quilled Or and gorged with a coronet Or. 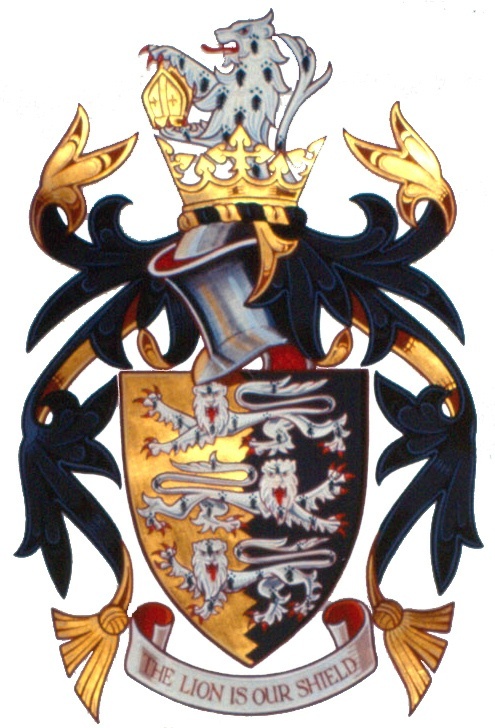 Granted 6th August 1996 the Society’s 21st Birthday the arms are based on the design used for the cover of original issues of the “Norfolk Standard”, the Society's magazine, and the Norfolk County arms. The field is that of the Norfolk arms, the palar line indented for difference, the lions are ermine as is the bend in the County arms. The demi-lion, on the Crest, holds a Mitre representing the Diocese of Norwich, which celebrated the 900th Anniversary of the Cathedral, the same year as the presentation of the Grant. The badge shows the lion with the coronet ancient around his neck and holding an ostrich feather which also comes from the County’s arms. The motto is a play on ‘shield’ deferring to our arms and to heraldry. 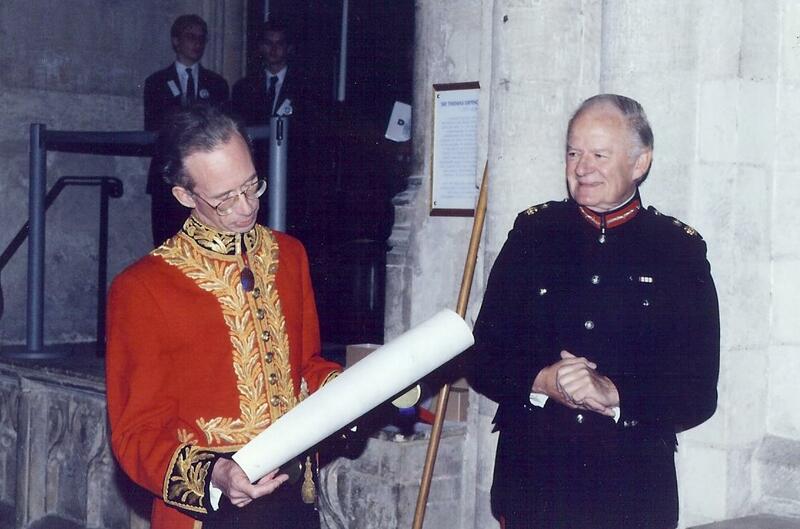 Presentation of the Grant of Arms to the Society’s Founder and Vice-President Henry Paston-Bedingfeld, Norroy and Ulster, King of Arms, by Sir Timothy Colman KG, Lord Lieutenant of Norfolk, at the Erpingham Symposium in Norwich Cathedral October 1996.